Gas Lantern Media | audio, video and words in review: With San Francisco in Mind. As promised, following my review/discussion of James Howard Kunstler's The City in Mind, I took stock of the application of New Urbanism in one of the United States' greatest cities: San Francisco. Known for a solid, timely and intuitive web of mass transit, as well as bike-ready streets, San Francisco is likely the best example of a city in California wresting its hulking frame from the wreckage of suburban sprawl. Of course, the city doesn't have an infinite amount of space to work with, layered artfully onto a narrow peninsula, but beyond even that, with the sprawling extensions of the Bay Area, San Francisco shows an awareness of space and a desire to be lived in by human beings. The majority of buildings are mixed use footprints, at least housing more than a single family, and often holding a retail location or restaurant on the ground level. And I'm speaking primarily of the outer sections now because the downtown, in the financial district and as one moves toward the northern end of the city the density is magnified. And beautifully. The city, as New Urbanism calls for, is eminently walkable, and moving from one end to the other, with help from the train, takes little time at all. Even after a short underground ride a person is capable of making great tracks by foot in little time. San Francisco makes walking from point to point easy and the texture of the city, the fabric of buildings and cultures and peoples makes hours of walking enjoyable. There are numerous atrocious quick build apartment buildings nested among the beautiful row house walk-ups, but the lack of space, a silly and wasted commodity in most of the West, means that everything must be in close proximity. A coffee shop and a grocer and a restaurant will be near by, which is exactly what humans need. And if a new look is necessary to freshen the mind and reinvigorate the senses, then it can be found within a few minutes time. By comparison, Denver lacks this walkability. Not entirely, as I've made great journeys around the city by foot, but one can hardly get out of a specific "neck of the woods" within two hours time. In San Francisco the faces of the city are attainable at every turn. 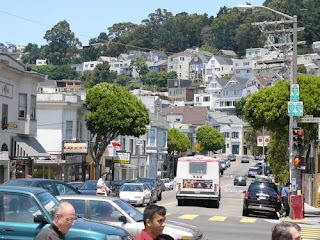 A bus ride can take you from the Mission to the Castro to the Haight in a matter of minutes. And while I acknowledge that the age and spirit of San Francisco is greater and different from that of Denver, it makes a great difference to have people stacked atop one another at every turn. We learn tolerance and love and respect through proximity. And patience. Though Kunstler did not address San Francisco in his text, I imagine he would be pleased with the city's functionality and the way that it loves the people living in it, rather than constantly battling against their mobility and happiness.